Adult apterae of Aphis verbasci are bright golden-yellow to pale-green and slightly wax-powdered (see first two pictures below). The apical rostral segment is very narrow, only slightly tapering and about 3.5-5.0 times as long as its basal width. Bands may occur on tergites 7-8, but may be absent. There is also a pair or irregular dark pleural sclerites on tergite 5 in front of the siphuncular bases - these are just visible in the two adult apterae in picture below, but are clearer in older adults. The black siphunculi are rather heavily built, strongly tapering and usually with a distinct outward curvature at the extreme base. The cauda of Aphis verbasci is short and tapering. Second image copyright Dr László Érsek, all rights reserved. Aphis verbasci alates (see picture below) have marginal sclerites on tergites 2-4, postsiphuncular sclerites, strong bands across tergites 7-8 and a small irregular median sclerite on tergite 6. 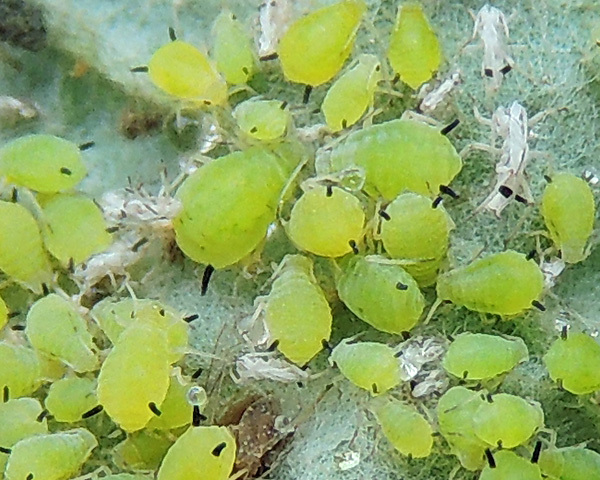 The mullein aphid lives under basal leaves of mullein (Verbascum spp. ), but it can also feed on buddleia (Buddleja spp. ), Eryobotria japonica, Lantana camara, and Scrophularia. 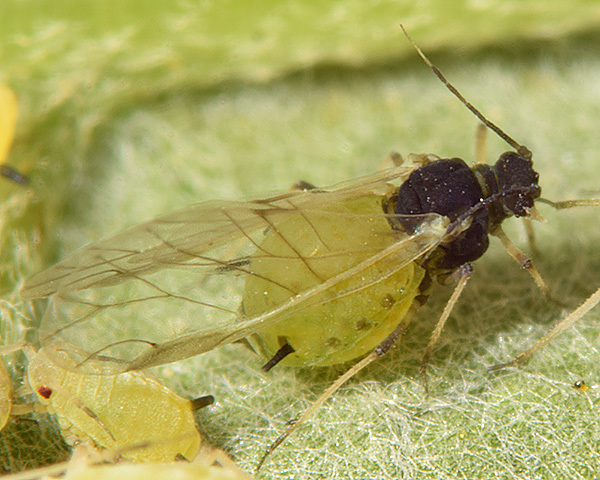 Oviparae and wingless males have been recorded in October. Aphis verbasci is found in Europe east into Russia, the Middle East, North Africa, Central Asia and Northern India. 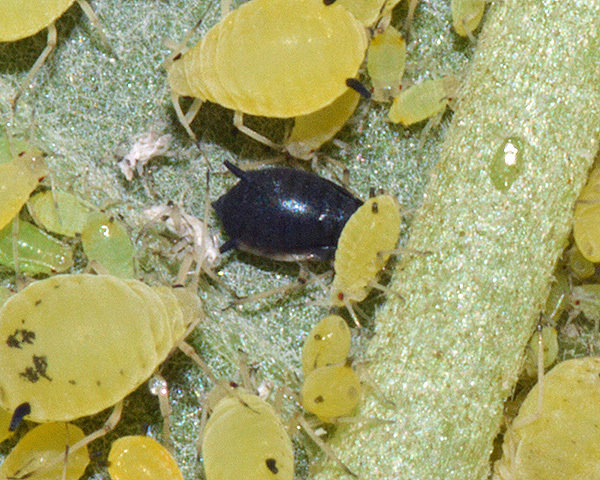 The life cycle of Aphis verbasci is described by Kanturski et al. (2014). Eggs are protected from the effects of winter under the dead leaves of the host plant until spring. 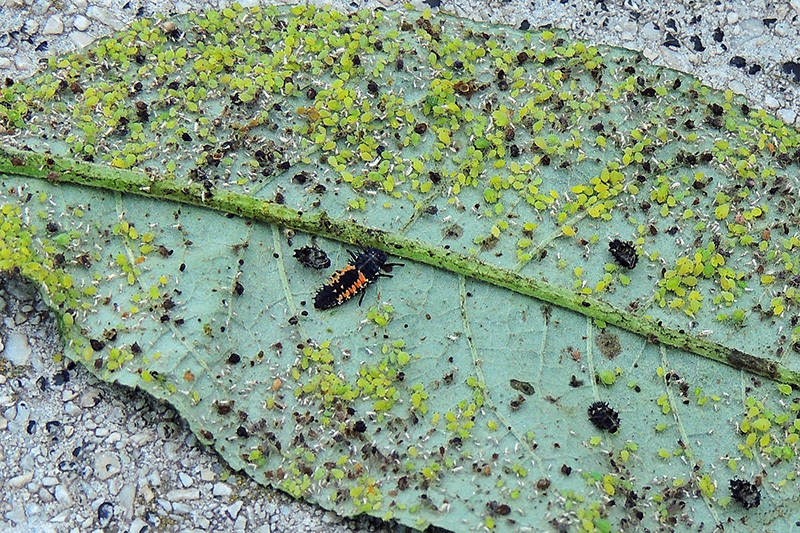 Colonies of Aphis verbasci then develop on the underside surface of the basal leaves of Verbascum or Buddleja lying directly on the ground. 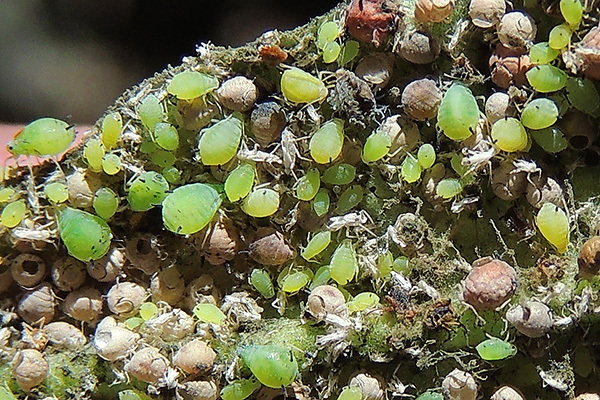 Very large populations of this aphid can build up on these hosts. The picture below shows one such large colony from Budapest in Hungary. Numbers peak in mid-late summer. The bisexual generation begins to appear in October, with numerous oviparous females and less numerous males and for some time those two generations exist together. After copulation orange eggs are visible in the female's body. Each ovipara then lays 2-3 big, orange eggs on the lower surface of the leaf. Kanturski et al. (2014) note that there are considerable seasonal differences in coloration. 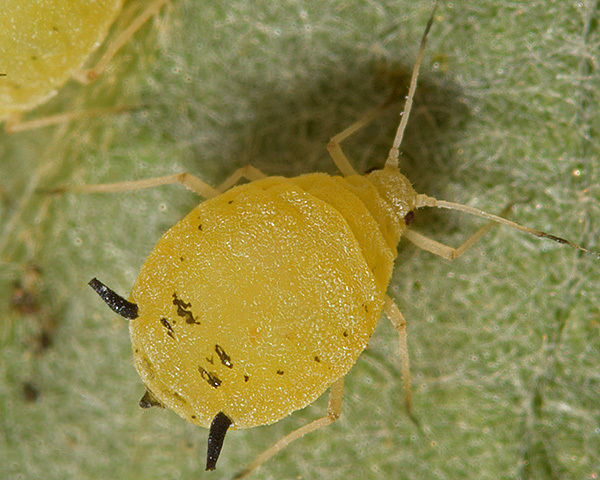 The large, summer colonies of parthenogenetic females of Aphis verbasci are golden-yellow in colour, but in autumn they have much paler coloration from pale yellow to pale green. The bisexual generation on the other hand is slightly pulverulent and of a dark green-olive colour. 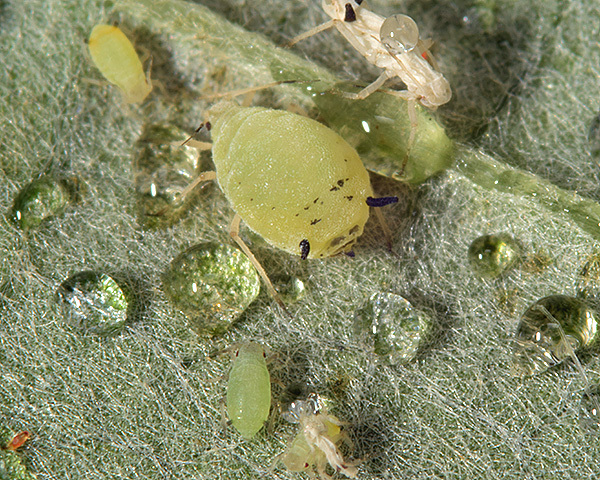 Aphis verbasci colonies produce large amounts of honeydew visible in the picture below. 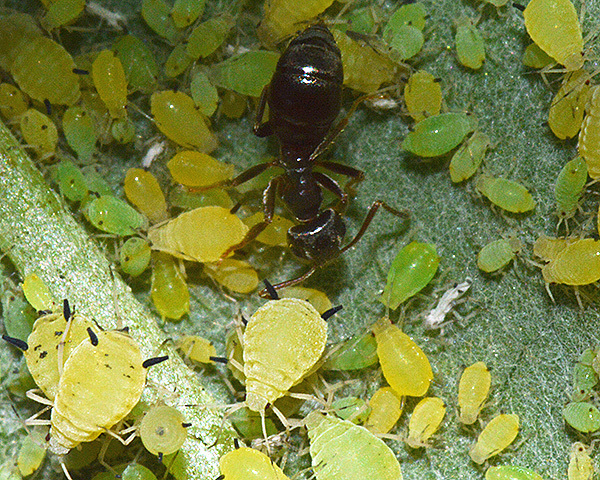 Despite the abundance of honeydew, we only found few ants (Lasius niger) attending the aphids (see picture below). The colonies may be attacked by a variety of predators and parasitoids. A coccinellid larva is visible in one of pictures above, and the picture below shows numerous parasitized mummies. 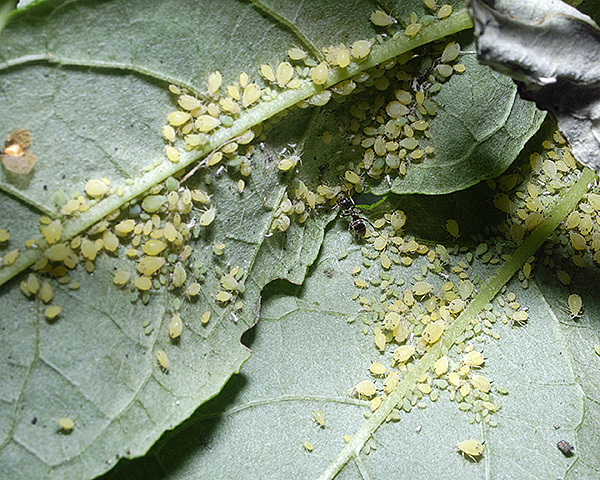 These were most likely the parasitoid Lysiphlebus fabarum which is a species commonly recorded for Aphis verbasci (e.g. Tomanovic et al. (2009)). In the East Sussex colony there were relatively few signs of predator activity, except for a single black parasitized mummy shown in the picture below, most likely an Aphelinus parasitoid. Aphis verbasci has been recorded on 14 Verbascum species. Blackman & Eastop list 11 species of aphid as feeding on Mullein (Verbascum species) worldwide, and provide formal identification keys. Of those aphid species, Baker (2015) lists 9 as occurring in Britain: Acyrthosiphon malvae, Aphis craccivora, Aphis fabae, Aphis nerii, Aphis verbasci, Aulacorthum solani, Brachycaudus helichrysi, Macrosiphum euphorbiae and Myzus persicae. Aphis verbasci has been recorded on Buddleja davidii, Buddleja madagascariensis and Buddleja paniculata. Blackman & Eastop list 11 species of aphid as feeding on Buddleia (Buddleja species) worldwide, and provide formal identification keys. Of those aphid species, Baker (2015) lists 10 as occurring in Britain: Aphis craccivora, Aphis fabae, Aphis gossypii, Aphis spiraecola, Aphis verbasci, Aulacorthum solani, Brachycaudus helichrysi, Myzus antirrhinii, Myzus ornatus and Myzus persicae. We especially thank Dr László Érsek for permission to use several images, above.